Tomorrow Art Every Day Month begins! We already have a great group signed up and ready to get started. If you happen upon the challenge mid-month, feel free to join in any time! For the year-long Creative Every Day Challenge participants, last Monday's check-in goes through today. Starting tomorrow and through the month of November, Creative Every Day participants can feel free to check-in any of the daily Art Every Day Month check-ins. If you're beginning Art Every Day Month tomorrow and you're feeling a combination of excited and nervous, you're not alone! I always get a bit of pre-AEDM jitters. One thing that helps me calm the nerves and prepare for the busy month of creating ahead is to do a bit of a brain dump into a sketchbook. I might write out any ideas I'd like to try out during the month, any unfinished projects I'd like to work on, supplies I'd like to use, and supplies I might want to pick up. I also like to just play and sketch and see what comes up. When I let my pen move across the page, ideas will often flow out. 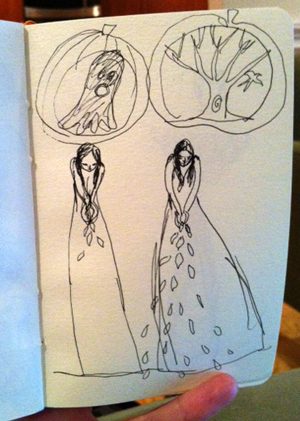 I can then turn to these sketches later in the month on days when I don't know what I want to create. Having some ideas to start with is very helpful when I'm creating every day! 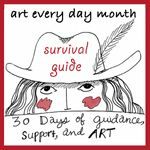 If you're all signed up for Art Every Day Month, but feel like you could use some extra support, motivation, and perhaps a daily prompt, then feel free to sign up for the Survival Guide, which provides a daily post on a private blog with ideas, inspiration, and encouragement to help you make it through the next 30 days of creating. I'm so excited to begin this month of intense creating with all of you! It's going to be a blast! I am so excited to be so focused and art everyday! You’re not wrong about the nerves, I have dancing butterflies at the moment. Great advice about the idea dump. I will have to do that before I start. The brain dump is a good idea. I would love to do this in Novemember but for years I do NaNoWriMo in Novemember. Writing is creative I so in a a way I am, but I think of it differently though. If you want to follow me I have to write 50,000 in 30 days so I will be busy. If you think it fits into your November scheme I will add it to your links when you post for your weekly linky widget. I am so excited to begin again. I always learn about myself and create in ways I didn’t know I had in me. This year, I am working toward a definite end: I have started to create a body of work focusing on women, especially women writers and artists who suffered (or suffer) from depression and how they deal with it. Many famous women authors ended up committing suicide. Another famous women author did not – I adore her writing and want to focus quite a bit on her work. I will be taking items from the traditional “women’s sphere” and covering them with book pages from these women (and others.) I plan to make some assemblage pieces with them… very excited. I’ve started a list of ideas; how many see the light of day will be a different matter! Is it really November already?!!? I’m so excited to sign up again Leah–and I love your sketch. It really touched me deeply. Sending you tons of LOVE!! Hello Leah. A blogging friend recommended Creative Everyday to me just in time for your November challenge. I have just revamped my art blog, so this a perfect way for me to launch it and challenge myself to post regularly. I’m not sure I will be able to write a post to go with every drawing, but I am going to try to post an illustration every day. I’m especially excited about meeting and sharing with other artists! Thanks so much for setting this up – it’s my idea of fun in the best way. getting ready in the liminal space! delighted to have the structure and “accountability” to keep on with words and pictures as the busy season unfolds! Thanks so much for the cohttp://ripelife.wordpress.com/mmunity emerging! Looking so forward to this!!! Hey! I am excited! This day was born with such vibrant color. From sparkiling golden leaves in the wind and scarlet burning bush, midnightblue lake with white caps, gray sky. I am inspired. But today–day one is dedicated to a new recipe. A new way at looking at my Gluten Free lifestlye. Hello, I am going to try this. I have been with you for a couple of years now and I haven’t been able to manage the ‘everyday’ bit. I will keep trying. I took a class at Castle in the Air in Berkeley, California last Saturday and made a fabric 3D Raven. I will take pics tonight and post on my blog by tomorrow evening. Please visit my blog for a recipe for pan sauteed apples a great fall morning treat.